Wedding Photos & My First Tattoo! After a month hiatus from my blogging, while being very busy planning my wedding, I’m excited to be back and sharing lots of fabulous vintage videos! In my first video for this week I’m sharing with you some of my wedding photos and footage, as well as my first tattoo! Let me know what you think of my first tattoo by commenting below! I have so many exciting posts to share with you this week, be sure to subscribe to my blog, and my YouTube channel! 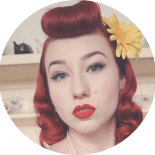 This entry was posted on October 18, 2016 by Miss Lady Lace in Pinup, Pinup Life and tagged 1940's, 1950's, blogger, first tattoo, glamour, inked, miss lady lace, miss lady laces pinup blog, perth burlesque, perth pinup, perth pinup blog, perth pinup community, pin up, pinup, pinup blog, pinup blogger, pinup fashion, pinup girl, pinup life, pinup lifestyle, pinup perth, red lips, retro blog, retro girl, retro glamour, tattoo, tattooed pinup, the perth pinup community, victory rolls, vintage, vintage blog, vintage blogger, vintage fashion, vintage girl, vintage glamour, vintage perth, vintage pinup blog.